I’ve been plugging away at the website again, trying to finally get things a semblance of complete. 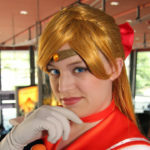 I added the costumes I wore from Anime North to Dragon*Con to the Costume page. Need to finish updating the “Film, Music and Television” section, as well as my original designs and modelling work. Once those are done, expect the page to change completely, as I attempt to have it all make sense. Commissions are open again! Please check the commission page for more details on that! It has been a very busy few weeks here at the Atelier, and I apologize for not updating! FanExpo was the weekend after that. I ended up wearing my Batgirl with Gillykins as Huntress on the Friday, Eternal Sailor Neptune with a full group of senshi on Saturday, and my closet Twilight Sparkle costume over top of my Psylocke on Sunday. We had a blast all three days, and I got to hang out with some of my closest friends. Then there was Dragon*Con. I was not aware that it was possible to have so much fun at a convention. It was possibly the best experience of my life, and I am so so so glad I went and was social. I made some amazing friends, and I can’t wait to see them again.